Geotimes  June 2004  Travels: Charleston, S.C.
Charleston, S.C., is a city that is as much steeped in history as humidity. That the Civil War began here is a venerable fact of the American saga, but it may come as a surprise to learn that some of the richest fossil deposits in the country are located near Charleston, and that a 7.6-magnitude earthquake occurred here, far from any tectonic boundary. Thus, Charleston has much to entertain the traveling geologist. Before encountering any of the area's geological assets, visitors to Charleston are likely to swoon at the Carolina landscape. In Looking For A Ship (1990), John McPhee describes Charleston as "a small antiquarian Manhattan," for the city's position on a narrow wedge of land between the confluent Cooper and Ashley rivers. Like Manhattan, there is a definite industrial feel to this port city's waterfront areas, but the downtown retains a refined Southern gentility quite apart from the soot and grime. Spanish moss hangs from a tree over the Ashley River, near Fort Dorchester, north of Charleston, S.C. Photo by Callan Bentley. The Spanish Moss that drapes all the trees undulates in the breeze, and lanky herons stalk the brackish inlets. Anoles (small chameleon-like lizards) scurry over the Georgian-Palladian facades of the city's oldest buildings. Architectural decoration comes in a profusion of columns, gables and long lateral porches. Charleston is a low city, with few buildings taller than five stories. Yet the bridges there are magnificent steep arches, tall enough for massive tankers and cargo ships to slip beneath. The result is a city that resembles a spider: a low hunched body with limbs straddling the surrounding waterways. Charleston's chief tourist draw is its attractive aquarium on the eastern edge of town. Though the admission fee is relatively steep ($15), the aquarium does not disappoint. A permanent series of exhibits showcase the aquatic life of each of South Carolina's ecological provinces, while the temporary exhibit "Secrets of the Amazon" features some of the oddest denizens of the South American forest in an eye-popping simulated jungle. A tank in the discovery lab allows you to handle live horseshoe crabs, an activity eliciting squeals from delighted young visitors. For kids, the only comparable experience is a giant inflatable Titanic outside the museum  a combination Moon-bounce and playground slide that is at a permanent incline of 30 degrees, stern bobbing in the air. The aquarium is much like similar institutions elsewhere around the country though, and if you're looking for something unique to the area, then the Charleston Museum is a better bet. Although currently situated in an angular modern building, the Charleston Museum is the nation's oldest museum, founded in 1773, 16 years before George Washington assumed the presidency. Its original mandate was "collecting materials for the promoting of a natural history of the province," a fact to which the massive right whale skeleton in the central hall testifies. While the Charleston Museum has come to focus on its historical collections, it retains a respectable array of natural specimens. For the paleontologically inclined, the museum boasts a stunning Gavailosuchus carolinensis, the fossilized skeleton of an Oligocene crocodile found nearby. There are also impressive local whale fossils from the same period and a giant false-toothed bird, Pseudodontronis. The bird is a Pliocene ancestor to modern pelicans, to which it appears similar in form, with the notable exceptions that it has a wingspan of 18 feet, and its jaws appear to have been borrowed from a barracuda. Impressive as these local fossils are, you have to be alert when touring this exhibit: Mixed in with the indigenous paleofauna are polar bears, giraffes, moas, and dinosaurs not native to the area. Little distinction is made between the provenances of the different specimens. 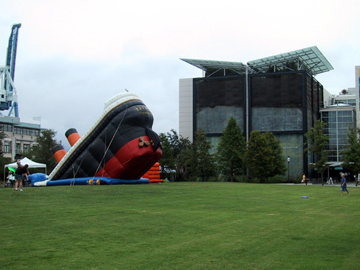 An inflatable Titanic provides bouncy fun for children visiting the South Carolina Aquarium, at right. Photo by Callan Bentley. A display on extinction occupies the terminus of the natural history hall. South Carolina was once home to the Passenger Pigeon, the Carolina Parakeet and the Ivory-Billed Woodpecker, all of which are now extinct. In a single diorama, all three native birds are displayed in an ornithologist's dream tableau  a dream that visitors realize will never again be fulfilled. Also, an interesting display on the life and work of South Carolina's original naturalist, Mark Catesby, shows the documentation of such natural wonders by early naturalists. And a small, dimly-lit case displays mineral samples with calligraphic labels. Near the museum and scattered throughout the city are historic buildings that survived not only the Revolutionary and Civil wars, but also the 1886 earthquake. It was by far the largest earthquake ever recorded in the southeastern United States, causing 60 deaths and shaking felt as far away as Cuba and New York City. The earthquake took place in deeply buried bedrock, overlain in Charleston and the surrounding coastal plain by thousands of feet of unconsolidated sedimentary strata, many of which bear fossils. A robust historical archive of earthquake-related photographs exists, and examining these photos in conjunction with a walking tour of the city is a fascinating exercise. 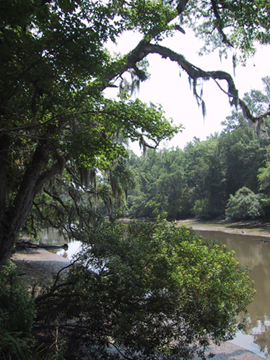 A short drive north of town will bring the seismic tourist to Fort Dorchester, a state historic site on the Ashley River. 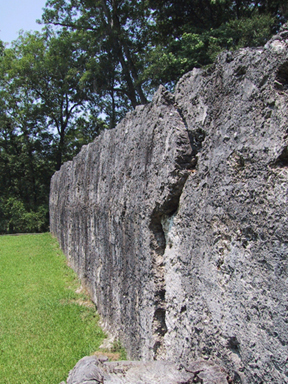 The fort was built in 1757 of "tabby," a concrete-like mixture of sand, oyster shells and lime. It failed to secure the nearby community of Dorchester from the Colonial British, who overran the structure and occupied the town in 1780. More than bullets modified the fort, however. An inspection of the tabby walls reveals massive cracks offset several inches due to the earthquake. Overall ground movement across the area appears to be a foot or more in distance. Evidence of the 1886 Charleston earthquake is preserved in the offset cracks in Fort Dorchester, near Summerville, S.C. Photo by Callan Bentley. For geologists who tire of the city's charms and feel the itch to head to the field, the deposits at Edisto Beach, south of Charleston proper, offer a rock-hounding respite. The Chandler Bridge Formation is the source for the huge Oligocene skeletons in the Charleston Museum, though casual diggers are more likely to find shells like the whorled snail Ecphora. Pond-excavation projects in adjacent West Ashley have also exposed some fossiliferous strata. A final option for fossil hunting is to scuba dive in the rivers, which is apparently the preferred way to search for shark's teeth. Divers have found other treasures beneath Charleston's waters, too. In 1995, maritime thriller author Clive Cussler and a crew of historical shipwreck-hunters located the H.L. Hunley, a Confederate submarine that was the first submarine in naval history to sink an enemy ship, the Union sloop-of-war U.S.S. Housatonic. The attack took place in February 1864, when the Hunley rammed the Housatonic with a torpedo lashed to a spar on the craft's bow. It was a Pyrrhic victory, though  while five Union sailors died, the entire eight-person crew of the Hunley also perished, asphyxiated at the bottom of Charleston Harbor. The cause of the submarine's demise has yet to be fully determined. The Confederacy's ill-fated secret weapon during the Civil War, the H.L. Hunley was the first submarine in the history of naval warfare to sink another ship. This replica stands outside the Charleston Museum, and the original ship may be seen in a warehouse in North Charleston. Photo by Callan Bentley. 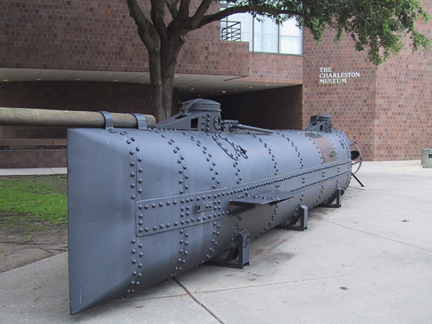 A replica of the Hunley is on display outside the Charleston Museum, and the original (dredged up from the harbor bottom) is in an archaeological rehabilitation center in North Charleston, in the labyrinthine warehouse district. Tours for the latter are available on weekends only, and possibly not worth the $10 entry fee. No cameras are allowed, and after much subterfuge, the Confederate-uniform-clad docents reveal the sub to be just a big piece of rust in a watery tank, obscured by scaffolding and equipment. It is a disappointing bait-and-switch. Another outdoor experience awaits geomorphologists and beachcombers: South Carolina's barrier islands. More than a dozen sand islands are offshore within driving (and boating) distance of Charleston. You can compare accreting and eroding islands by taking a pair of walks  one along the north shore of Folly Island and another along the beach on Isle of Palms. While Folly is being stripped away by the action of the surf, freshly deposited sediments are augmenting Isle of Palms  new expensive beachfront property being assembled before your very eyes. After a strenuous afternoon studying the shoreline, head for the neighboring Boathouse Restaurant, which overlooks the inlet and marsh. Nothing satisfies oceanside hunger like fresh seafood, cooked to order. Sunset will find you on the upper deck, iced drink in hand, mulling over Charleston's active geology.